A control burn jumped the fire lines and spread to several pieces of farm equipment and a large camper Monday afternoon 29-February. At 14:01, 9-1-1 received several reports of a controlled burn that had been spread by light winds and was threatening several buildings. Engine 26 arrived to find a rapidly spreading, fast moving woods and grass fire with a camper and several farm implements burning. Click here for more information. 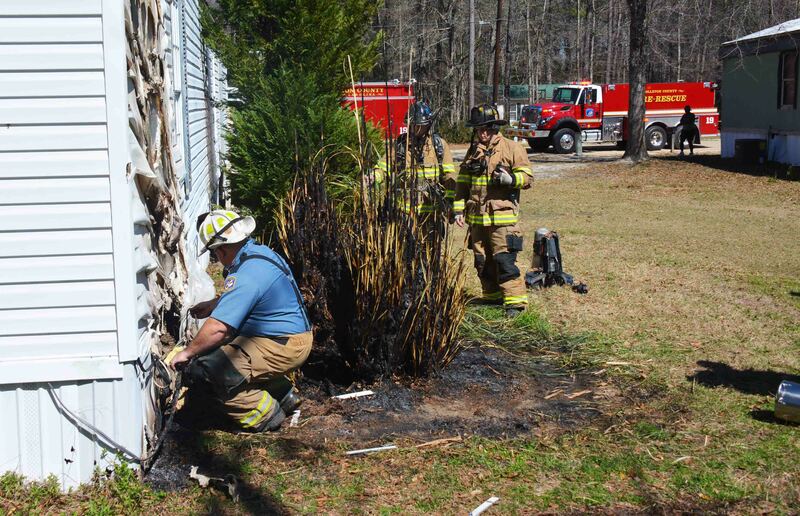 A singlewide mobile home suffered damage to the exterior after shrubbery in the yard was accidently set on fire. The flames consumed several bushes in the yard, melted the vinyl siding and began burning the sheeting under the siding. The homeowner extinguished the flames prior to Engine 19 arriving. Firefighters searched under the home and inside using thermal imaging cameras to insure the fire was out. The fire did not spread to the interior of the building. Fire crews were on the scene for approximately 30 minutes. Click here for more information. Our condolences go out to Battalion Chief Brent Dalton for the death of his father, which occurred this afternoon. Arrangements will be announced as soon as we receive that information. Please keep Battalion Chief Dalton and his family in your thoughts and prayers. 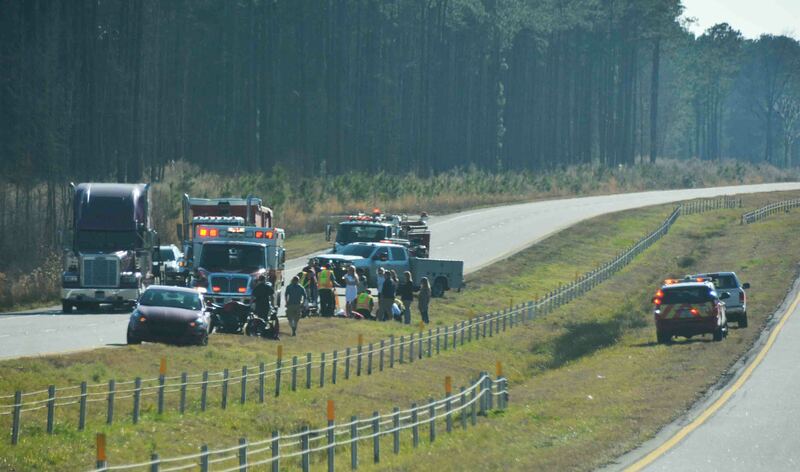 A Walterboro man died from injuries he received in a single car, high speed crash on I-95 near the 49 mile marker northbound, Friday afternoon at 17:49. 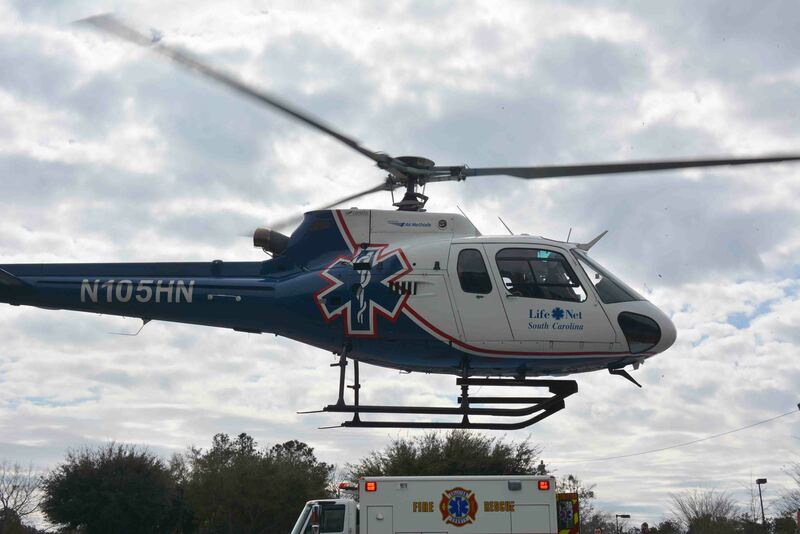 The female driver, suffered multiple injuries and was flown by helicopter to the Trauma Center at MUSC in Charleston. Multiple callers to 9-1-1 reported the car left the roadway and rolled over several times before striking several trees. Click here for more information. A Kansas man received multiple injuries in a high speed motorcycle crash on ACE Basin Parkway (US Hwy 17) just south of the intersection of Green Pond Hwy. (SC Hwy 303) at 15:37, Friday afternoon 19-February. The north bound motorcycle lost control on a straight section of rural highway causing the driver to fall from the motorcycle. He was wearing a helmet, but suffered a head injury. Several nurses and doctors returning from a conference stopped and render aid prior to the arrival of Fire-Rescue. Click here for more information. Bloodwork and PPD (TB) injections for the annual Fire Brigade Clearances will begin on 29 February. For the list of locations, dates and times along with the list of pre-scheduled physicals appointments, click here. 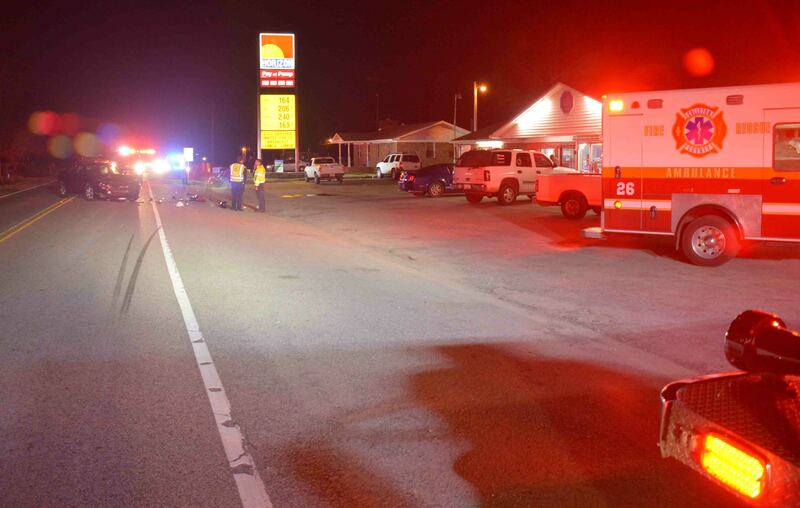 A 60 year old Ruffin man died from injuries received in a two vehicle accident in front of S&G Grocery located at 14201 Bells Hwy at Cross Swamp Road Thursday evening 18-February. At 18:16, Fire-Rescue was notified of the accident. Medic 18, stationed 2-1/2 miles away arrived within four minutes to find the driver of a Vulcan motorcycle lying on the ground with multiple traumatic injuries. The patient was in critical condition. Click here for more information. 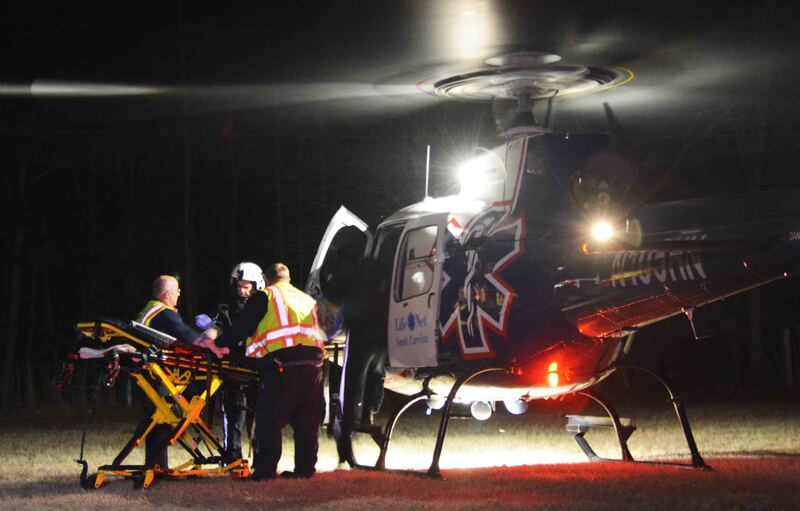 An adult male was critically injured in a single car MVC in the 12000 block of Cottageville Highway (US Hwy 17-A) Wednesday evening 17-February. The accident was reported at 22:40 with the caller advising the patient had been ejected from the vehicle and was under the car. It appeared the SUV had been traveling south bound on Cottageville Highway when it left the roadway on the right shoulder and hit a driveway. The vehicle flipped over, then landed at the next driveway. Click here for more information. A singlewide mobile was destroyed and an adult male was injured in an early morning structure fire at 121 Trackside Drive south of Lodge at 06:13 Tuesday 16-February. Engine 18 arrived the find the mobile home, with an addition well involved. Firefighter-Paramedics deployed multiple handlines to extinguish the blaze. 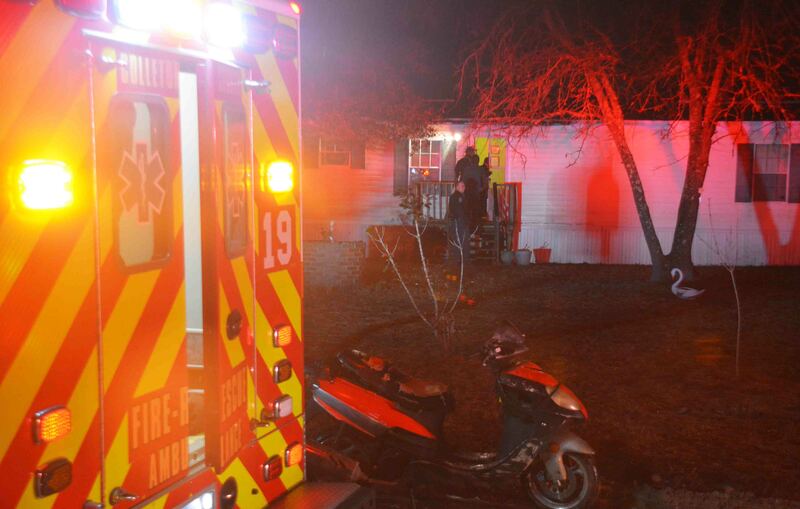 The mobile home was completely destroyed and the addition suffered heavy damage. Water supply was handled with Tenders and the origin of the fire appears to have been on the porch. Click here for more information. 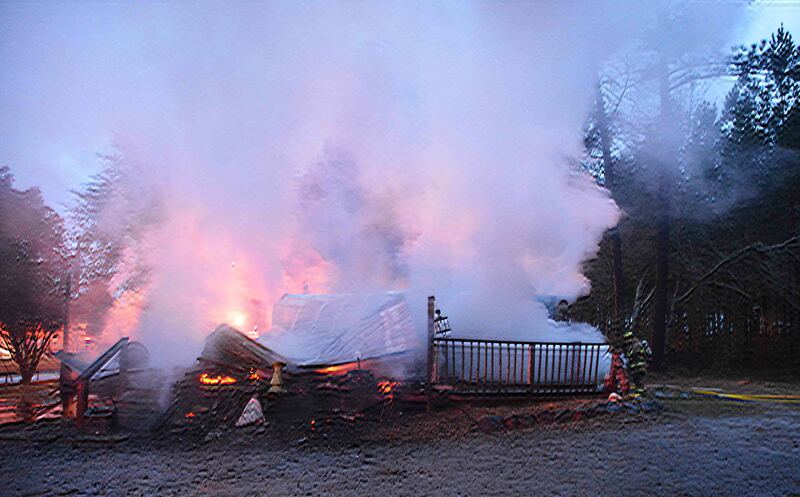 A 3500 sq ft dwelling was destroyed in an early morning fire in the 5400 block of Prices Bridge Road Tuesday morning 16-February. 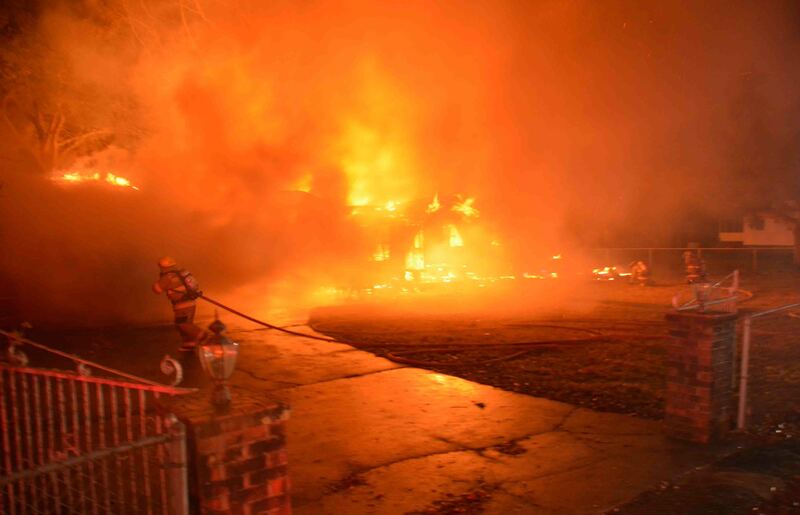 At 03:02, 9-1-1 was notified of the incident, with the caller reporting flames coming from the home along Chessey Creek. The home is located near the end of a five mile long dead end road. The fire occurred during a severe thunderstorm with blinding rain and 33 mph winds. Engine 6 arrived to find the single story block building approximately 80% involved. Click here for more information. Two people were injured in an altercation at 194 Seigler Drive Monday evening 15-February at 21:53. A 28 year old male received multiple stab wounds and was struck in the head. A 45 year old female received a severe wound to her hand after she reportedly attempted to break up the altercation. Firefighter-Paramedics treated both patients at the scene. The male was rapidly transported by Medic 19 to the Trauma Center at Trident Medical Center. Click here for more information. 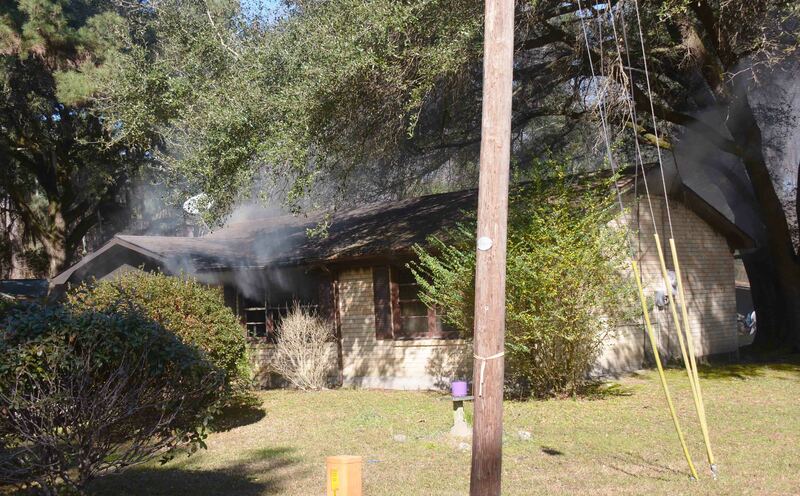 An mid-day structure fire heavily damaged a Moselle residence, Monday 15-February. 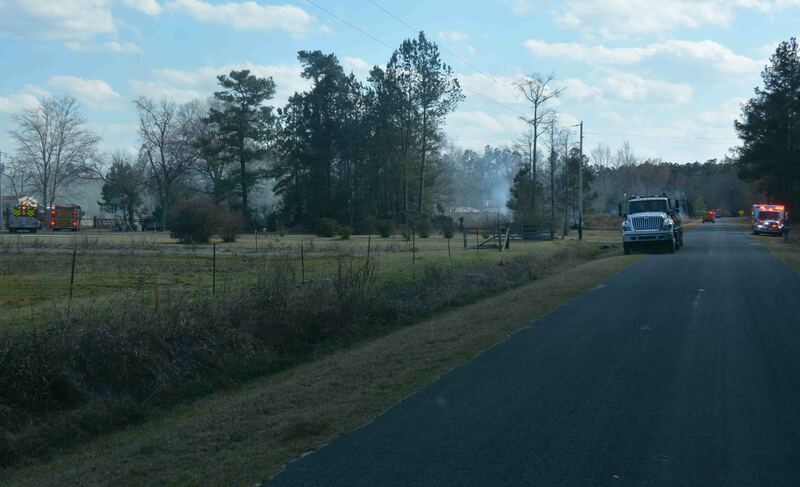 A motorist reported seeing smoke and flames coming from the rural home at 12:16. Engine 18 arrived to find fire showing from the roof and eves on three sides of the doublewide mobile home. A portion of the roof over the master bedroom had already collapsed. Firefighter-Paramedics deployed two 1-3/4 handlines into the dwelling through the front door. They encountered heavy fire conditions in the east side of the building and in the attic space. Click here for more information. A 63 yr old Islandton man was severely injured in a single car, high speed MVC in the 1200 block of Ashton Road Saturday evening 13-February. 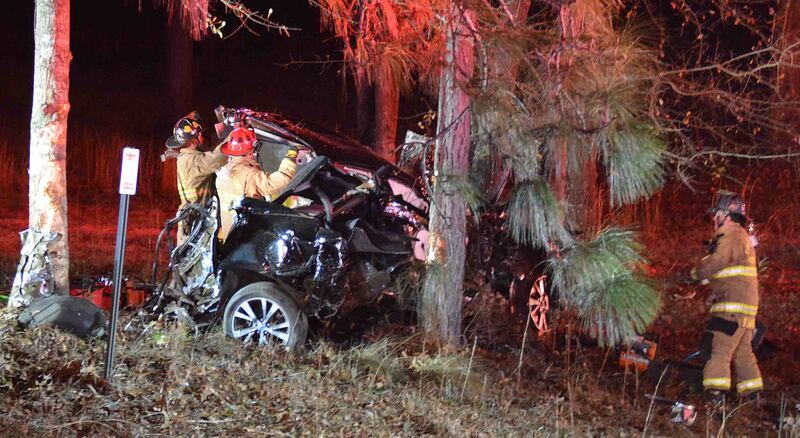 At 20:53, a Station 15 firefighter radioed in to dispatch that a vehicle had struck a tree and the driver was trapped. The northbound Ford Escape failed to negotiate a curve and ran head-on into a large pine tree in front of the firefighter’s residence. He began rendering aid until Fire-Rescue units arrived. Click here for more information. A 21 year old Cottageville man died following a two vehicle head-on collision in the 5800 block of Cottageville Hwy (US Hwy 17-A) Friday morning 12-February at 05:35. Fire-Rescue units from Station #9 arrived to find a 2007 Ford Pick-up truck on the north bound shoulder with heavy damage. The engine had been thrown 50 feet into the nearby swamp. 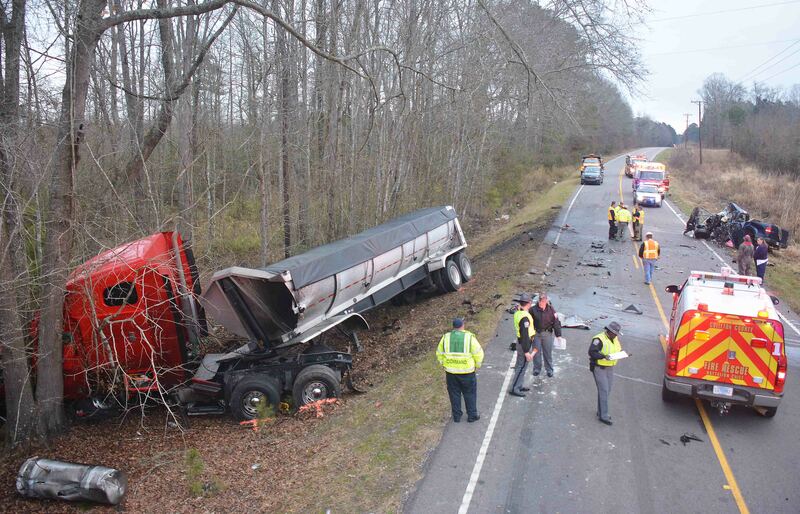 The driver suffered multiple traumatic injuries and was trapped in the wreckage with no signs of life. Click here for additional information. An adult female suffered a possible head injury during a fall in the 17000 block of Sniders Highway Saturday afternoon 06-February at 12:52. 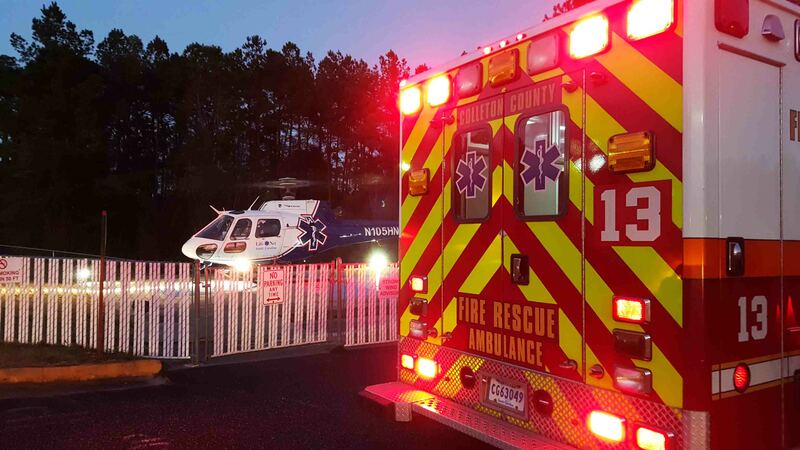 Firefighter-Paramedics treated the woman at the scene, then rapidly transported her to the helipad at Colleton Medical Center to meet with LifeNet 4 stationed there. She was transferred to the flight crew without incident, then flown to the Trauma Center at MUSC in Charleston. Click here for more information. 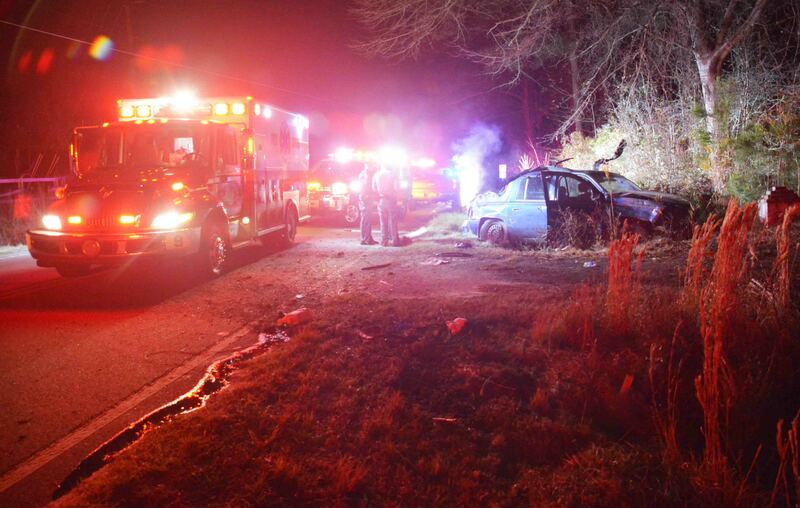 A 25 yr. old Round O woman suffered multiple traumatic injuries in a single car crash in 1000 block of Industrial Road north of Walterboro Friday evening 05-February. Fire-Rescue was notified of the accident at 23:10 after a witness advised 9-1-1 a car left the roadway and struck a tree. Engine 19 and Medic 19, stationed two blocks away, arrived two minutes later to find a 2016 Nissan with massage damage... click here for more information. 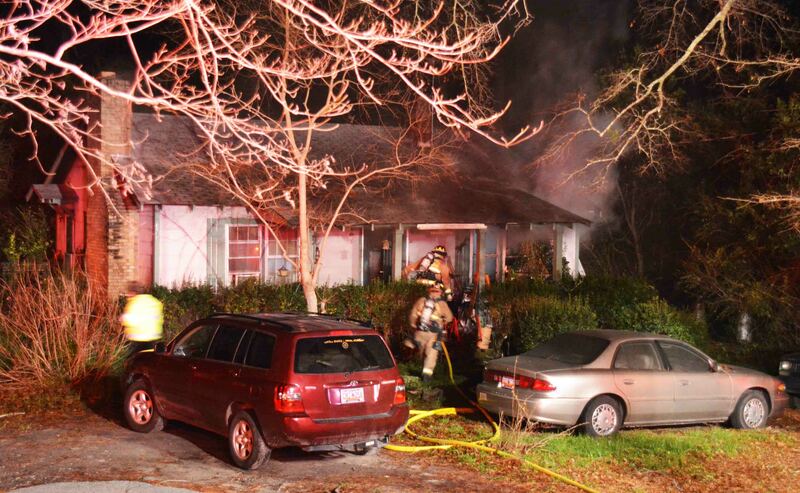 An adult male safety escaped his burning home after he was awakened by a smoke alarm Friday morning 05-February. The fire started in a bedroom and spread to the hall. The man had been sleeping on the couch in the living room. The bedroom door was closed, which contained the flames until they burned through the door. Fire-Rescue was alerted at 04:58 and arrived four minutes later from Station 1, one and half miles away. Click here for more information. It is with sadness that we announce the passing of Retired Firefighter James Farish of Hendersonville. We were notified yesterday afternoon of his funeral which was also held yesterday (02-February) at Herndon Funeral Home. Farish served as a Volunteer Firefighter in Colleton County for over 40 years. He joined the newly established Colleton Rural Firefighters Association in 1969 and was instrumental in organizing a Station in his community of Hendersonville to serve the southern portion of the county. The Hendersonville Rural Volunteer Fire Dept, which was the eighth station of the Volunteer Firefighter’s Association, was organized in 1974. Farish and other community members constructed their own station on the Lyons Property which is on Orchard Road near his home. The original station still stands today, but was replaced by the current Station 8 on Black Creek Road in the late 1990s. Farish was a dedicated and active member. He continued to serve until his health forced him to retire in 2011. He will be greatly missed. Mr. Farish was 79. Please remember his family in your prayers. 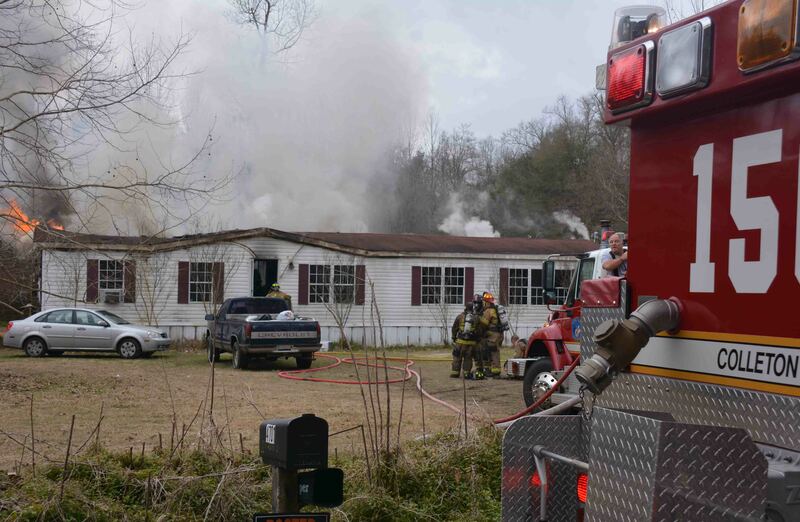 A Cottageville family of seven was displaced following a mid-day fire in their home Monday 01-February. At 13:43, 9-1-1 received a fire alarm activation from a residence located at 2161 Rhode Drive north of Cottageville. They were able to make contact with the homeowner who advised there was a fire in the home. Engine 9 arrived minutes later to find a large amount of smoke coming from all sides of the single story brink veneer dwelling. Click here for more information.